If you’re like me, you like to get your Christmas shopping done early. The fact that I’ve barely started at the beginning of October makes me a little itchy if I think about it….so I won’t. But one thing that I’ve found to be a great gift for all ages is a homemade book. Today, I’m teaming up with the folks at Blurb to share a little about how you can make a custom book for your family or friends. 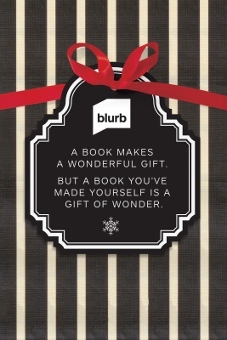 This year Blurb has put together a Gift Guide to make it even easier to create a book. They show samples of types of books you can make (in addition to what I’ve already mentioned, think cookbooks, planners, personalized notebooks and journals) as well as a graphic showing you all the tools available in their software and instructions on how to make a book. They are also offering a a 20% discount through October 7th if you use code EARLYBIRD20. If you have any questions about making a Blurb book, I’d be glad to talk with you about it. I have had nothing but good experiences with them and I cherish the books that I’ve made! Happy Creating! *This post falls under my link/review disclosures and contains affiliate links. However, all opinions and comments are strictly my own. What to get those who do so much for us?